A new thread has been posted at Cgsociety calling for the members’ choice for the best animated villain character of all time. I have tried to list some of the characters that flash my mind. My ultimate choice would definitely be Davy Jones-the captain of the Flying Dutchman, in the movie ‘Pirates of Caribbean’. Perfection has never been so perfect. ILM has pushed all limits of reality in CG. DJ’s screen presence is absolutely terrifying. Hats off to Bill Nighy, who has done the acting for this character. My next choice would be General Grievous from the movie Star Wars. Although I have seen the movie only once, for some reasons, he is fixed in my mind. 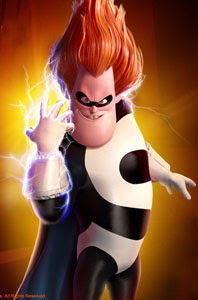 The Flame shaped hair-do villain ‘Syndrome’ from the movie ‘The Incredibles’ is also a well made character with villainous personality. Can Pixar go wrong ! I would also mention Marcus Carvinus from the movie Underworld Evolution just for the excellent CG work. This Luma pictures created model (thanks to Zbrush) has been made with amazing details. Technology has played a great role in the making of some of the stunning characters of 2006. Nothing engages my mind as much as 3d animation. But still, it wouldn’t be complete if I don’t mention the villains in the 2d animation movies too. ‘Scar’ from the movie Lion King is one of the best. 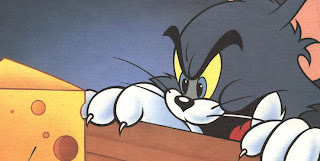 His sinister looks and sick attitude makes him one of the all time favorites. Next is a little weird. He is the most entertaining villain of all time and the most harmless (!!!!) too. Meet Mr. Tom. sorry arasu, no place for comedians here ! we'll have one 'best animated comedian of all time' very soon.